Squirrels act as nature’s alarms. 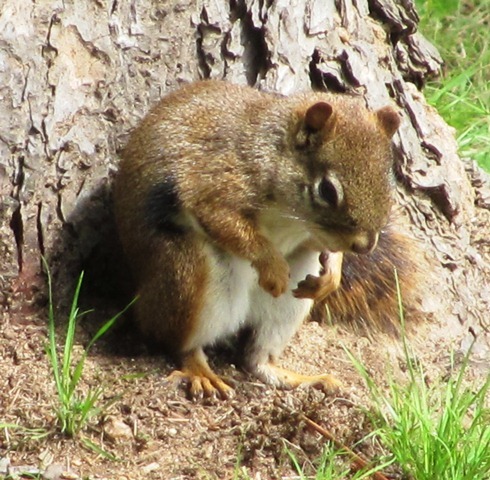 Squirrels in the forest chatter and scold if they see a problem. They act as nature’s alarm bells. Today I met one of society’s alarm bells: a woman who scolded and nagged non-stop at me about accessibility problems for people with physical disabilities. She was deeply passionate about the issue, and I could see how she might annoy administrators and politicians. In just 20 minutes of listening – I couldn’t get a word in – I learned about the challenges of getting to work from outside the city on our commuter train. I hadn’t quite realised that when someone with a disability gets off the accessible commuter train or subway downtown they are on their own, unless they are lucky enough to wait on a street corner for our para-transit service, assuming their train was not delayed. Many struggle with streetcar stairs and impossibly long walks to get to work. In one case, staff located at a building near a subway station were moved to a building a 20 minute streetcar ride away. The commute is now hugely challenging for those who cannot manage the streetcar stairs. Through them God works for change in our world.